Caring for an elderly spouse carries an emotional price tag unlike that of any other caregiving relationship. Assisting your spouse with mental and physical challenges changes the dynamic of your relationship, requiring you to maintain a delicate balance between being a caregiver and spouse. 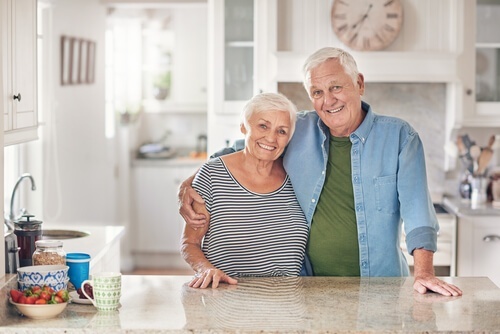 It’s difficult to see your life partner struggle with an illness or injury, and because you may also be experiencing age-related changes to your health and routine, you may not have the physical or emotional stamina you once had. One of the best ways to ease the stress is to get support. Friends, family members, or professional caregivers can step in to carry part of the load so that you can focus on meeting the most important needs of your spouse. It’s also helpful to make a plan that includes your spouse’s care, any housekeeping responsibilities, and your own needs for support and rest. Let’s look at some considerations that will help you develop your care plan. What Has Triggered Your Spouse’s Need for Care? In many cases, a spouse’s need for care is triggered by a health event that makes it difficult to continue with your normal routine. For example, your husband may experience an injury or fall that requires mobility assistance or physical therapy. Perhaps your spouse has received a health diagnosis such as Parkinson’s disease or Alzheimer’s disease which results in gradual decline and increased needs over time. Or perhaps you have both been experiencing energy or sleep issues which make it difficult to function during the day. All of these things can cause significant changes to your spouse’s ability to care for himself, participate in activities you both enjoy, or move around easily. How Can You Provide the Best Care for Your Spouse? Caregiving involves more than meeting physical needs. You and your spouse both have mental and emotional needs as well. Here are some ways you can support your spouse in all three of those areas. Physical challenges are often the initial reason people need extra help. These challenges may include an illness or injury, or they may simply be related to the natural aging process. Differences in size and strength can also present challenges for wives who are seeking to assist their husbands with mobility needs or fall prevention. One of the most important things you can do to help your spouse with physical challenges is to encourage exercise. Exercise helps keep muscles strong and may improve mobility or slow down the progress of certain physical conditions. Talk to your doctor about incorporating daily walks, water activities, or physical therapy into your loved one’s routine. You may also want to consider using an assistance device such as a walker or wheelchair to reduce the risk of falling. Mental stimulation is important to help your spouse remain engaged in activities he enjoyed, and studies show that it may also delay symptoms of Alzheimer’s disease. Consider playing games, doing crossword puzzles, listening to music or reading together to keep your loved one mentally sharp. Taking the time for conversation can also encourage your spouse to stay mentally engaged with what is happening around him. Both you and your spouse need emotional support as you face age-related changes together. Depression is common, especially among people who can no longer participate in activities they once enjoyed or who are trying to juggle the needs of caregiving without any help. If you think that you or your spouse may be suffering from depression, talk to your doctor. You can also support your spouse emotionally by praying together, inviting friends and family to visit, and seeking out support groups with others facing similar challenges. How Do You Care for Your Own Needs? Perhaps the greatest challenge when caring for a spouse is that your own needs for support often get overlooked. It’s vitally important, however, that you reach out for assistance before stress takes a permanent toll on you both mentally and physically. Here are a few ways to get help. Ask Others for Assistance - Reach out to your friends and family and ask them for help. They may not know how much responsibility you carry, or they may not know specific ways they can offer support. Take Breaks - Schedule breaks into every day, as well as some time to get away from the house when needed. In some cases, it may also be beneficial to explore the possibility of respite care so that you can spend several days away recuperating and resting. Get Help With Housework - If you have always managed most of the housework or meal preparation, it may feel strange to ask for help. Remember, however, that your responsibilities have greatly increased with the additional needs of your spouse. Getting help from friends, family, or a professional caregiver can give you the freedom to support your spouse more intentionally. Consider Professional Care - There may come a time when you do not have the physical strength or stamina to provide the care that your spouse needs. In these cases, a home caregiver can be a great help. By allowing the caregiver to assist with things like mobility, personal care, and housekeeping, you are free to offer your spouse the emotional support and love they need. Caring for an aging spouse is a demanding responsibility. By putting a strong support system in place and asking for help when you need it, you can give your partner the care they need while also managing stress levels and protecting your own health and wellbeing.